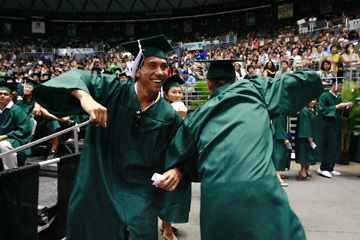 Kamu Andrade and Mark Sullivan hooked arms and danced yesterday while waiting to receive their Bachelor of Arts degrees during the University of Hawaii commencement at the Stan Sheriff Center. The ceremony had one of the largest number of graduates in the university's history, with a total of 1,374 eligible bachelor's degrees and 962 graduate degrees. Susan West couldn't have wished for a better gift on Mother's Day. At the Stan Sheriff Center yesterday, the Oklahoma resident beamed proudly as she watched her 21-year-old daughter graduate with a bachelor's degree from the University of Hawaii. "I knew she'd do it," West said, excitedly. "This is wonderful. I'm crying." Thousands of family members and friends -- including plenty of lei-adorned moms -- filled the arena to watch commencement for more than 2,000 bachelor's and advanced degree students. The ceremony was one of the largest in the 99-year history of the University of Hawaii at Manoa, spokesman Jim Manke said. James Horton, a George Washington University professor of American studies who is a visiting scholar at UH-Manoa, gave the commencement speech, telling a sea of green-robed graduates they are America's "best hope" for resolving "the contradiction between the nation's lofty rhetoric and its natural reality." In the United States, Horton said, all citizens are said to be created equal. But, he added, inequality and poverty persist. "Obviously, we have a great distance yet to go," he told the graduates. "And you have a big job ahead." 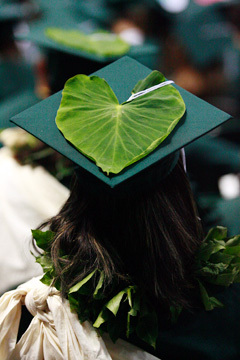 A University of Hawaii graduate from the Center for Hawaiian Studies wore a taro leaf atop her hat during the UH commencement exercises. China native Jadie Goo, a travel industry management student, delivered the undergraduate commencement address and urged her fellow students to "believe you can achieve." The mother, who was able to secure a 4.0 grade-point average throughout her degree, also thanked her husband for his support. "Without you, I wouldn't be here today," she said. As they lined up to head into the arena yesterday morning, bachelor's graduates snapped photos with friends, reminisced over the last four -- or five or six -- years and giggled at each other's cap decorations. One student used masking tape to write "all pau" on her cap. Education graduates sported plastic apples. "We're all very close," said Milia Macfarlane, 23, who was in a circle of other graduates from the School of Education. "It's exhilarating to be graduating." Manoa Chancellor Denise Konan said the graduates were diverse -- both in their backgrounds and educational interests. "We know our graduates are prepared to be citizens of the world," she told attendees, adding that yesterday's graduates join a group of more than 130,000 living UH-Manoa alumni. "You now have a lifelong bond to UH-Manoa," she said. For Jamica Mamou, yesterday's graduation was especially momentous. The San Francisco native became the first person in her family to get a bachelor's degree. "It's a huge relief," the medical technology graduate said. "No more all-nighters."